Yes! A Hot April (so far)! Since the last Phuket weather blog update on April 4th, it's continued hot and sunny with clear skies at night, very light winds and the occasional shower of rain/little thunderstorm here and there - exactly what you'd expect in April. Nevertheless, I am anwering emails and questions on Twitter every day from people who are worried that the weather is no good. The Phuket weather blog is the one place to find the true weather in Phuket - sure I can't update every single day, but if you follow me on Twitter, I normally mention the weather every day, and if you look top left of the page, you see links for webcams, weather radar, satellite images .. very good for real weather data - especially the webcams, just remember that Thailand is 7 hours ahead of GMT, so you'll need to look at the webcam during our daylight hours to see anything! Sunrise in Phuket is about 6:15am at the moment, and sunset about 6:30pm. Been working hard all week at Sunrise Divers. The weather now is perfect for diving. I am sure we have lost business due to the rains and all the (incorrect) information on the internet. Phuket was bloody wet and for a couple of days diving was all but stopped, but since March 30th it's been fine, and the weather now - hot and calm - is ideal for a day out diving or a liveaboard trip to the Similan Islands. Want to dive - contact me! 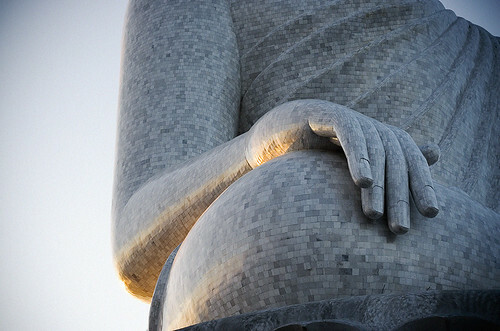 The Buddha faces east, so the setting sun casts an orange glow on the back of the Buddha. I loved the light on the arm (below). 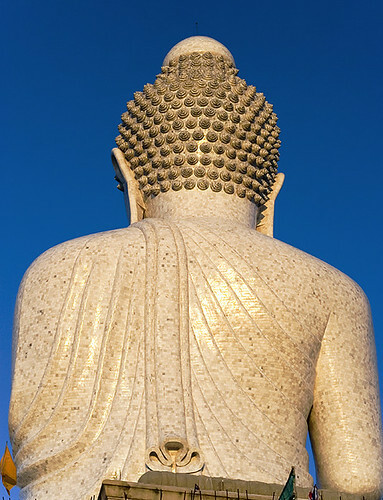 If you want to see sun on the Buddha's face.. well as I say, sunrise is about 6:15am! The view above is from the Buddha looking north across the hills. 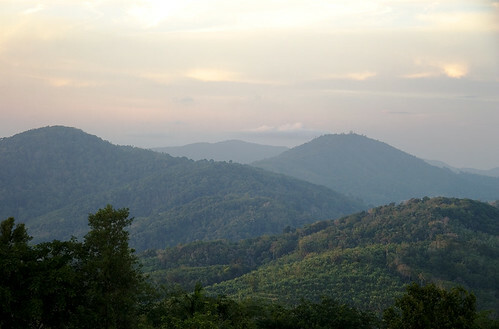 Phuket is hillier and greener than people may realise, though you are not going to see this if you stay by the beach - get out and explore a bit! It's been sunny every day this week, but there was some rain here and there - on Wednesday and Thursday I had rain on our house while I was at work at Karon Beach - there was no rain at Karon. Got home to find my rain gauge reading 9mm on Wednesday and 11mm on Thursday. Must be some rain with all that heat. My forecast for the next week: HOT, HOTTER, DAMN HOT! Which is good because the 13th is Songkran! 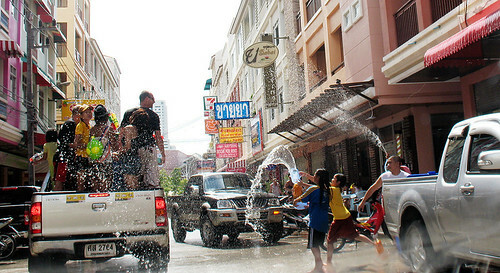 More Songkran photos here. Oh, and Phuket Bike Week is on this weekend with lots of bikes and music and bike related events in Patong. And a final word, just in case I have not made it clear - the weather in Phuket right now is HOT and SUNNY!